A former commander of Russia’s nuclear forces warned the Obama administration this week that China’s short-range nuclear missiles are undermining the 1987 Intermediate-range Nuclear Forces (INF) Treaty between the United States and Russia. Retired Col. Gen. Viktor Yesin, a former commander of Russia’s Strategic Rocket Forces, also said in an interview with the Washington Free Beacon that U.S. and Western arms specialists have dramatically underestimated China’s nuclear arsenal. Beijing’s warhead arsenal, he said, likely is between 1,600 to 1,800 nuclear warheads and bombs. Yesin met with Pentagon, military, State Department officials, and members of Congress and congressional staff Wednesday and Thursday. The visit culminated with consultations Thursday with Rose Gottemoeller, acting undersecretary of state for arms control and international security, to discuss the national security risks posed by China’s growing nuclear arsenal. "It’s not a secret that we talked about China’s nuclear potential and the increase of the Chinese nuclear arsenal," Yesin said, speaking through an interpreter. Additionally, Yesin said he raised concerns during the meetings about the proliferation of short- and medium-range nuclear missiles, currently banned for Russia and the United States under the INF treaty. "In this area, both Russia and the U.S. are restricted by the 1987 INF treaty and the obligations not to have these weapons and other countries are allowed to have them, for example China," he said. 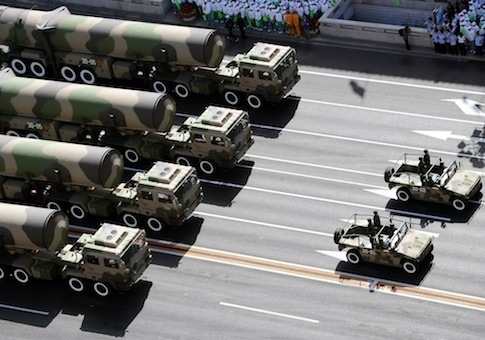 China is building up its short- and medium-range missile forces with at least three systems that are dual-capable—meaning they can be armed with nuclear or conventional warheads. They include the DF-11, DF-15, and DF-21. "China is pushing quite hard now in developing those systems and they are deploying them on the Russian border and it is threatening to the Russian Federation," Yesin said. The INF bans missiles with ranges of between 310 and 620 miles, and between 620 and 3,420 miles, as well as launchers and related support facilities. Yesin, who has been a consultant to the current commander of the Strategic Rocket Forces, has a long career with nuclear weapons. As a major during the Cuban missile crisis, he said he was prepared to launch a nuclear-tipped SS-4 missile to coordinates he later learned would have bombed New York City. Yesin said his American counterparts are concerned about the Chinese missile buildup because of U.S. obligations to provide nuclear deterrence for allies in the Pacific. The United States provides nuclear assurances to South Korea and Japan that it will protect those countries from nuclear threats from North Korea and China. Yesin said Moscow and Washington "came to an understanding that we need to analyze the proliferation of the technology for these short- and medium-range missiles." The two sides need to identify the nuclear missile proliferation risks and to "assess those risks without panic and being very pragmatic and reasonable," he said. "And then we will need to identify the steps that could of course, not eliminate those risks, but [that] would allow us to mitigate them significantly," Yesin said. On China’s nuclear arsenal, Yesin repeated earlier warnings from the spring and summer that "many experts are underestimating the expansion and growth of Chinese nuclear potential and underestimated the risks related to this problem." The problem is compounded by China’s secrecy about its nuclear weapons and Beijing’s refusal to reveal data on their numbers and purpose. "This lack of knowledge causes even more problems," he said. Yesin said he raised his concerns with Gottemoeller but said that while she was "responsive to our concerns" the senior State Department arms control official had "no reaction" on how to deal with the problem. He noted that diplomats are "very careful people and they tried to hide their thoughts." "So I took it in stride, I was understanding. But I personally have known Rose Gottemoeller for 12 years," he said. At the Pentagon, Yesin met with officials in the office of the secretary of defense and on the Air Force’s air staff. He also spoke to several House members and met with committee staff in the Senate. Yesin said he is confident, based on his work as commander of Russian nuclear forces, that "we are underestimating Chinese military power." China is seeking to eclipse the United States as the world’s leading power by 2049, the 100th anniversary of the communist takeover, he said. "So they want to become a superpower and without a strong military that would be impossible," he said. "At least it has to be equal to the U.S. in military capability, and that’s what poses danger to the national security interests of both Russia and the U.S."
As for numbers of warheads, Yesin challenged the official U.S. government and private experts who say China has as few as 240 warheads and a maximum number of around 400. "My estimate of China’s nuclear arsenal today is 1,600 to 1,800 warheads," he said. About 850 warheads are for operational deployments on bombers, land-based missiles, and sea-based missiles, he said. "The rest of the warheads are in storage and some of them are awaiting dismantlement," Yesin said. The low numbers for total Chinese nuclear warheads used by U.S. arms control specialists are wrong because the estimates do not include aerial bombs and tactical nuclear missile warheads. Russia’s estimate of China’s strategic nuclear missile warheads number is around 300 to 400 warheads and is closer to the U.S. estimate, he said. "But people who count the weapons that way leave the Chinese nuclear short-range and medium-range missiles, tactical nuclear missiles, outside of this count," he said. China also has more than 300 Q-5 bombers and copies of the Russian Su-30 jet, which could carry about 320 warheads called the B-5, ranging from 5 kilotons to 20 kiloton in yield. A kiloton is the equivalent of 1,000 tons of conventional explosive. "Also there is a mistake that some experts think that DF-11 and DF-15 are single-use [missiles] that are only armed with conventional warheads," Yesin said. "And I know that these are dual use systems, and they can carry a conventional or nuclear warhead." The retired general said it is "world practice" to build short- and medium-range missiles for use with both nuclear and conventional warheads. Israel, India, Pakistan, and Russia also do the same based on a pragmatic military approach of utilizing systems effectively. "Why would we consider ourselves pragmatic enough to do so and deny the Chinese are pragmatic themselves, because they are very pragmatic?" Yesin said. Add 200 warheads for the dual-capable missiles and it adds up to 850 total warheads, he said. Also, China stores additional warheads in the thousands of miles of nuclear tunnels known as the Underground Great Wall. An example of large warhead storage is the United States, he said. The U.S. arsenal announced in 2009 has a total of about 5,100 warheads. But there are only 1,700 strategic delivery systems plus 200 nuclear bombs stored in Europe. "So it’s less than half of the total declared amount," Yesin said. "So why would think that China is different country, that they don’t have a single nuclear charge in storage? It can’t be that way. They’re practical people. And they’ve dug a ton of tunnels and they hide their backup systems and munitions in the tunnels." Asked about the reliability of Russian intelligence estimates on Chinese nuclear forces, Yesin said commanders "have to take these numbers with certain considerations." "It would be a mistake to think that any intelligence can bring up absolutely correct numbers," he said. Yesin said he did not trust completely in the intelligence estimates provided to him when he was commander but "I considered them close to truth—not absolute truth, but close to truth." However, estimating nuclear weapons stocks is made easier by measuring fissile material produced and then "doing the math" of counting 25 kilograms of highly-enriched uranium and 5 kilograms of plutonium for each warhead. "It’s an estimate but it’s a reasonable estimate," he said. Yesin, who works for the state-run U.S. and Canada Institute of the Russian Academy of Sciences, also said his estimates of Chinese nuclear stockpiles is based on former Soviet Union physicists who worked in China or communicate with Chinese nuclear scientists. "They do communicate with each other," he said. "It’s a robust communication. And so they know the types of kinds of reactors the other countries possess and they know the capabilities of the material production in these types of reactors." China also did not design a single nuclear reactor for its military and uses older Soviet designs that were replicated and modernized. Hans Kristensen, a private nuclear arms analyst with the liberal Federation of American Scientists, said he regards Yesin’s estimates as too high "because it extrapolates warhead inventory from an estimate of fissile material production." Kristensen said reports about China’s nuclear-capable fighter bombers and nuclear-capable DF-11s are "vague." He also doubts China has deployed nuclear warheads, only nuclear-capable delivery vehicles. And he said in an email that China’s nuclear storage is probably a "small mix" of spares and excess warheads and new warheads planned for the DF-31 and JL-2 missiles. "The bottom line, though, is that his estimate significantly exceeds that of the U.S. intelligence community of ‘a few hundred’ warheads, most recently stated by Stratcom Commander Robert Kehler," Kristensen said. This entry was posted in National Security and tagged China, Nuclear Weapons. Bookmark the permalink.